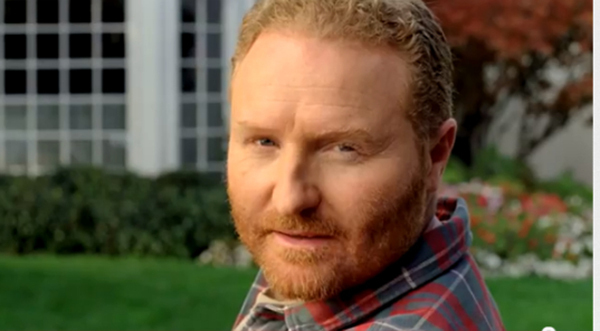 My doppelganger, the Scotts lawn guy. I don’t like yard work. I don’t like yards. Part of this is because I’m a ginger. I burn easily, meaning time spent outside has me looking angrily up at the sky, knowing every minute I’m stacking up my skin-cancer points like “Hunger Games” characters’ names in the reaping bowl. Part of it is because of the years I spent in the Army performing “area beautification”–cutting, trimming, hedging and combing through grass, hand picking clover. The idea of spending time maintaining a lawn because I’m supposed to now triggers my oppositional defiant disorder (link), which I have apparently. Now I’m not above working outside. I’m not too good for it or too prissy or whatever. I’m as much of a man’s man when it comes to swinging tools, shooting terrorists or generally hewing life from the wilderness. A part of me actually enjoys the zen-like state I can slip into while working outside. However, again, I don’t like lawns. I don’t like how we’re addicted to them. Thank Lancelot “Capability” Brown (link) for that one. He’s the chap who introduced manicured lawns to England in the 18th Century, which spread in popularity around the world, landing with our suburban penchant for the modern lawn. Now, any self respecting homeowner must maintain a suitable lawn. It’s a matter of pride, decency and status. A well-manicured lawn is but a small sign of a successful life–like well behaved children and a perfect, functional family. It ends up being part of the pose that covers over the mess of the actual human condition. Part of me wishes our homes were cordoned off like houses/compounds in other countries. Let me maintain a wall and gate–perhaps a mailbox or street light. Let the inside of my property be as it is. No need to flaunt the lushness of my green patch of natural earth for the world. I mean…we don’t showcase our living room to the outside world as a sort of trophy, right? Seems strange to do that for our outdoor suburban property. I don’t like the allergies that come with cutting the lawn. The sniffles and the sneezes. My nose gets stuffed up–and I’m just a casual allergy sufferer. I know my lawn cutting contributes to the misery of others. I don’t like that. I’ve seen the bleary eyes and sadness in the faces of more severely allergic individuals. I’m sorry! Phoenix and Las Vegas–in yesteryear lauded as places for allergy sufferers to migrate to to ease their suffering, now are the worst cities for those with allergies (link). So many lawns, trees, golf courses and pools have teraformed the natural landscape into a smothering cloud of irritants and pollen. I don’t like the pollution. Each weekend, about 54 million Americans mow their lawns (link). 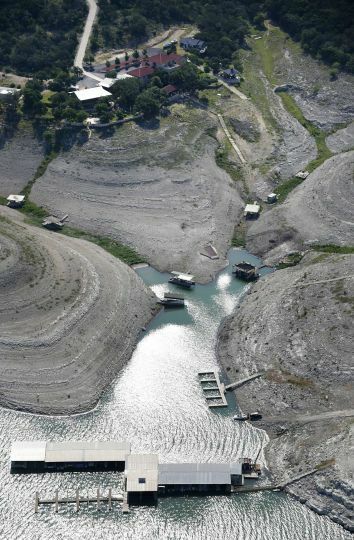 That amounts to guzzling down 800 million gallons of gas through a year. The EPA estimates we spill 17 million gallons of gas per year while we try and refill these machines. That’s more than the Exxon Valdez. Every year. And lawn mowers are terrible polluters themselves. They burn gas and oil, churning out crazy levels of naughty greenhouse gases (link). One hour of running a lawnmower can produce the emissions of up to 11 new cars. All to cut grass. And just this week. Because plants being plants, we’ll have to do it again in a few days–our own Sisyphus-like punishment (link). Lake Medina is down 60 feet from normal. I don’t like how little we use our lawns. Now I’m not a parent. I realize I don’t have little children running through the yard, but everyone around my house has a family. I bet most people around your house have a family. Proportionately, what percentage of time spent in your/their house is spent out in the lawn? I wager it’s not very much. Sure, there’s the occasional birthday party or cookout, but compared to living-room time or video games or time in the kitchen, how much time do any of us really spend out in our lawns? I mean out there, rolling around, feeling that beloved grass in our fingers, breathing in the smell of it? 10% of our time? 5%? 2%? 1%? Just seems like a big money and time sink for something that just sits, unused. I don’t like how I let everybody down because of my lawn. My lawn, my property, my business, right? But not really. An unkempt lawn is an eyesore, right? It reduces that “curb appeal” that keeps homes desirable and property values up. It classes down the neighborhood. No one likes to be THAT GUY/GIRL who doesn’t keep his/her lawn clean. Especially when the person next door works outside as much as a second job to make his/her patch of greenery the envy of the Garden of Eden. I travel. I go out and do things. I work with people. I have a long list of hobbies. I’m a generally good person. But one look at the house where I stay and I can feel the judgment–the weeds, the dead patches, the crab grass. It’s very different from my neighbors. And I know it. And it bothers me, even when I’m away on business or vacation. And I don’t like that it bothers me. I don’t even know most of my neighbors, but I feel the lawn becomes this first line of interaction. I’m a good or bad neighbor, depending on how much of my financial budget and spare time I spend slaving away at my patch of manicured unnatural grass. In our crazy world, full of hunger and brokenness and a struggling environment, lawns just seem to be the craziest thing to worry about. Add in the fact that I sunburn at a drop of a hat and I circle back around to my initial postulation: I don’t like yard work. I don’t like yards.